Thales Alenia Space has signed two study contracts* with both the European Space Agency (ESA) and NASA in the frame of a joint ESA-NASA study on an international Mars Sample Return mission to return to Mars to bring home samples of the surface representing a major new step forward in the exploration of the Solar System, its formation, and especially in the study of Mars and questions about its possible habitability. Life on Mars cannot be definitely excluded, given that water has already flowed on its surface, and minerals that only form in the presence of water have been discovered. Although not that far from Earth within the Solar System, Mars is very different from Earth, especially with temperatures ranging from a high of 27 degrees C to a low of -133 degrees C. Yet there are still several similarities, including a day that is comparable to the 24-hour day and the presence of seasons. The ExoMars probe built by was launched in 2016 to detect any traces of life on Mars. The follow-up to this program is planned for 2020. 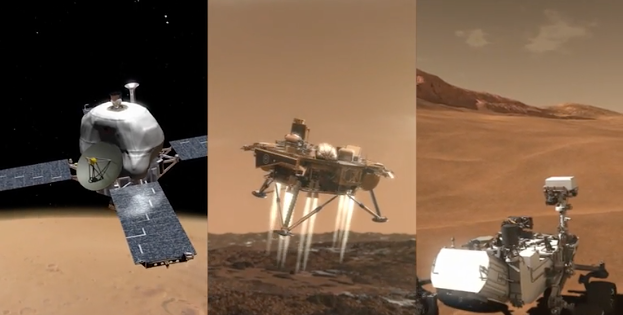 With the ExoMars program continuing, ESA is also working closely with their American counterpart, NASA, on studying concepts for a new international mission, namely Mars Sample Return. Within this study, ESA is specifically in charge of the Earth Return Orbiter (MSR-ERO) and the Sample Fetch Rover (MSR-SFR). Thales Alenia Space, as prime contractor for these aspects, will define the overall architecture and preliminary design for MSR-ERO and the MSR-SFR. It will also be in charge of characterizing the main equipment involved, to be subsequently supplied by a European industrial consortium. With its major role on the ExoMars mission, which should enable Europe to land on Mars in 2020 to continue the search for traces of life, Thales Alenia Space is contributing its expertise and resources to support the upcoming discoveries that leads to a better understanding of the Red Planet and prepares for future human missions to Mars. The Mars Sample Return mission is designed to send a spacecraft (MSR-ERO) into orbit around Mars, with a lander (MSR Sample Retrieval Lander) that will descend to the planet’s surface. The lander will carry the SFR that will collect the samples that have been cached by the NASA Mars 2020 rover from the Martian surface. The SFR will transfer these samples into a mini-rocket (Mars Ascent Vehicle, developed by NASA), which will launch them into Mars orbit. Once the samples have been located and captured by the ERO spacecraft, the samples will then be sealed in a biological containment system to prevent any contamination of Earth by this non-sterilized matter, and placed inside an Earth Entry Vehicle. ERO will then leave Martian orbit and head back to Earth. When the Orbiter returns to Earth's orbit, it will jettison the Earth entry vehicle with the samples, and they will be recovered back on terra firma and analyzed. * Phase A/B1 studies: These two studies include the conceptual analysis of equipment to guarantee mission feasibility, define a reference baseline for the rover and orbiter and its subsystems, and define the development phases. Thales Alenia Space is in charge of the entire design phase for the two ExoMars missions (2016 and 2020), leading a European industrial consortium. For the 2016 mission, Thales Alenia Space produced the Schiaparelli entry and descent module (EDM), as well as the Trace Gas Orbiter (TGO), still in orbit around Mars and performing scientific readings of the Martian atmosphere. For the 2020 mission, Thales Alenia Space is responsible for the overall system design, development of the navigation and guidance system, and the rover entry, descent and landing system; it also supplies basic parts such as the radar altimeter. Thales Alenia Space is working with OHB (Carrier Module) and Airbus Defense and Space UK (Rover Module) on this program. The 2020 mission is now at an advanced state of development. Some of the equipment for the descent module will be delivered this year, followed by the carrier module and the rover, so that spacecraft integration can be completed for a launch now planned between July 25 and August 13, 2020.